ACS Athens engages its community in healing the Earth - Praise the Trees! ACS Athens continuously takes an active stand in civic responsibility and environmental issues. 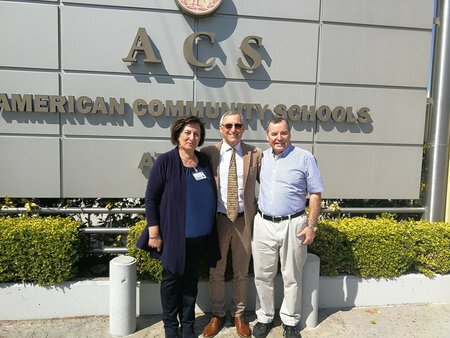 “The school’s dedication in Serving Humanity drives ACS Athens to seek strong partners who share the same vision for a better world,” said ACS Athens President Dr. Stefanos Gialamas. Such an opportunity presented itself at the World Human Forum Convergence at Delphi, when Dr. Gialamas, met Don Mullan, a renowned social entrepreneur and founder of the Hope Initiatives International project under the DonMullan Organization. During his recent visit to ACS Athens, Mr. Mullan discussed with Dr. Gialamas the significant synergy potential between the two institutions and announced their partnership regarding Africa’s Great Green Wall, an initiative of the African Union, under the auspices of the United Nations Convention to Combat Desertification (UNCCD). ACS Athens, through its civic responsibility and volunteer programs, that are embedded in its academic curriculum, will involve its community to become active supporters of this cause. ACS Athens is the first school in the world to partner with the Great Green Wall initiative in order to develop a similar environmental project in Greece according to the needs and biodiversity specifications of its ecosystem. “Through the collaboration and partnership with ACS Athens we hope that we can inspire schools, colleges and universities around the world to join with us in planting millions of trees worldwide and across the Sahel Region in Africa in an effort to halt desertification, grow food security, restore degraded lands and combat the threats posed by Global Warming.” Don Mullan noted on the foundation of this alliance. African countries have taken the initiative to restore degraded land and thus prevent the estimated 60-million people fleeing sub-Saharan Africa due to desertification. The Great Green Wall is planned to span 13 countries with 8,000 kilometers from east to west and 15 kilometers in depth. Inspired by this effort, Don Mullan has initiated a number of projects and has been instrumental in achieving a EUR 1.2 million contribution from the Irish Government for a transcontinental UNCCD inventory of the Great Green Wall with a view to a major upscaling of efforts to ensure this 21st Century New World Wonder is delivered by 2030. BBC Video: Why is Africa building a Great Green Wall?